A selection of pictures of Assuan, Egypt's sunniest southern city located along the Nile river some 150 km south of Luxor. Assuan is a pleasant town where to relax for a few days. Here the Nile is at its most beautiful, flowing between amber desert and granite blocks. 24 photos of downtown Assuan with its narrow alleys, markets and bazaars. 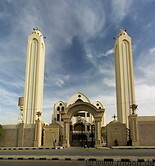 7 photos of the Coptic cathedral in Assuan which has recently been renovated. 9 photos of the Nubian museum in Aswan. 20 photos of the Nile river and feluccas in Assuan. 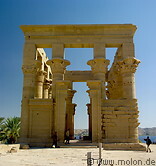 5 photos of the Aswan high dam, which was built in the 1960s.